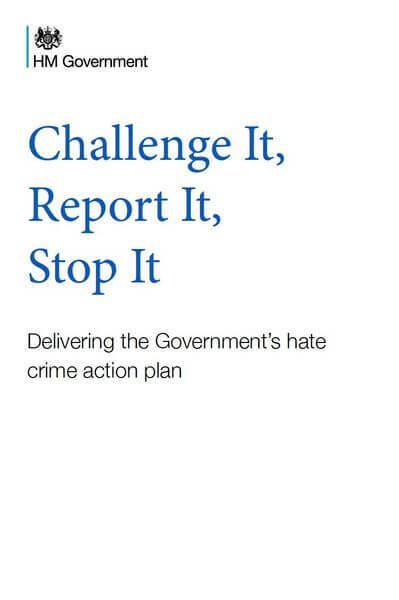 The coalition government is making significant progress in the battle against hate crime, according to an official report out today (1 May). The government’s Hate Crime Action Plan documents the government’s work to tackle abuse online and via social media, against transgender people, and the spike in anti-Muslim sentiment following the murder of Lee Rigby. It highlights the abolition of central targets, new guidance on prosecutions, better education of secondary school pupils, a code of practice for victims and improved recording by police as key to understanding and reducing the problem during the past two years. Work will now continue to transform care and support for people with learning disabilities and to ensure UK social media providers remove illegal hate-related content online. The government is also working in partnership with major internet service providers in the UK and USA to reduce the harm caused by hate material on the internet. “Hate crime has devastating consequences for victims and their families, and can divide communities. The coalition government is determined to stamp out this ugly and unacceptable crime in all its forms. “We have already made significant progress ensuring transgender hatred is taken into account in the courts during sentencing, working closely with police to encourage hate crime victims to come forward, and encouraging Police and Crime Commissioners to tailor specific responses to local issues and priorities. To coincide with the launch of the report, the Crime Prevention Minister is visiting St Gabriel’s College, Camberwell, which is currently hosting an exhibition on prejudice created by the Anne Frank Trust (AFT). Challenging attitudes and behaviour in young people is central to the government’s core aim of preventing hate crime. Government funding has helped the AFT to educate thousands of students across London and the north west, including training peer guides to dispel stereotypes and promote integration and cohesion in their communities. “The Anne Frank Trust UK is honoured to be recognised as a contributor to the government’s Hate Crime Action Plan. “Our work with over 60,000 young people in schools and in the criminal justice sector every year challenges prejudice and hatred across the UK. Improving the evidence base on hate crime. In December, the government published ‘An Overview of Hate Crime in England and Wales’, combining data from the independent Crime Survey for England and Wales and police recorded crime. 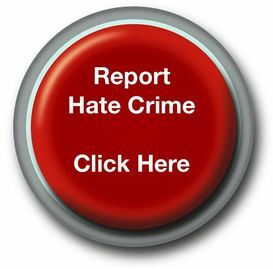 Tackling internet hate crime. The government is working in partnership with major internet service providers in the UK and USA to reduce the harm caused by hate material on the Internet, while protecting the right to freedom of speech. Improving classroom materials for teachers. Resources are available on the True Vision website, co-designed by the Crown Prosecution Service and based on real life experiences of young people with the aim of increasing pupils’ understanding of prejudice and explore ways of challenging it.